Ten Strawberry Street Colored Silver Rim Glass Charger Plate 13"
Home > Products > Ten Strawberry Street Colored Silver Rim Glass Charger Plate 13"
Set a glamorous and elegant table with the Ten Strawberry Street Colored Silver Rim Glass Charger Plate 13". A striking backdrop for dinner service, this charger is adorned with a silver-print rim embossing that beautifully frames dinnerware. 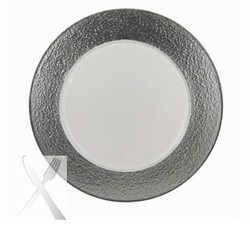 Made from premium quality clear glass, this charger plate combines an upscale appearance and unparalleled durability. Perfect for multi-course meals, this charger plate has ample space to accommodate any size plate and is ideal for wedding receptions, lavish parties, and other celebratory occasions. To retain its luster, hand washing in warm water is recommended.